Remove the brown algae and take care of sufficient, lighting between 8 to 10 hours a day. 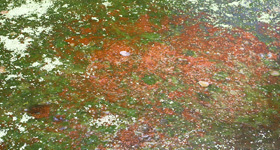 Remove all the decayed material from your pond and apply quickly growing oxygen plants. Test the water for its pH value. If it is too high (pH 9 to pH 10), add CO2 in order to reduce the value. Another method is to put a little peat in your filter. This will influence acidity of the water and consequently the pH value. Apply quickly growing underwater plants. If early in the morning the pH value is relatively low (pH 7 – 8) and in the evening relatively high (pH 8 – 9) this proves that the pond environment functions, where the plants will properly grow and the water will be clear.